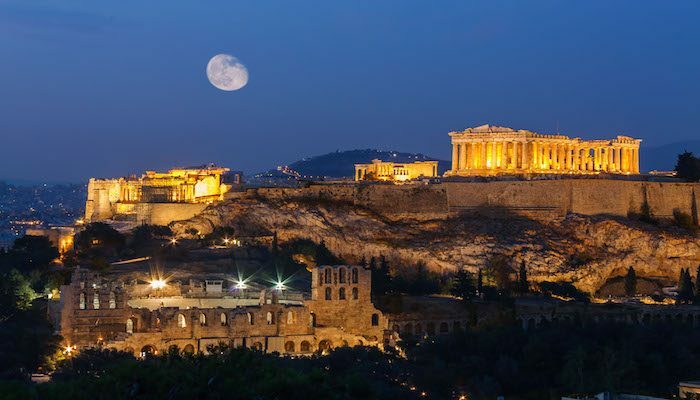 The Acropolis and the sites around it is one of the most visited sites in Greece. The area makes for a spectacular run — we recommend going early to avoid the crowds and the heat…or alternatively, it is spectacularly lit at night. One of the benefits of running in this area is that there are several pedestrian only zones. From the Acropoli metro station across from the Acropolis Museum, Dionysiou Areopagitou is a wonderful route surrounding the Acropolis, passing by the Acropolis Museum, the Herodou Attikou Theatre, connecting at Apostolou Pavlou and finishing at Thiseio and the Ancient Agora, right in front of the railway station (Thiseio). These pedestrian only streets are lined with cafes and shops, and are good for running. It is hard to design a specific route here, as there are multiple paths. 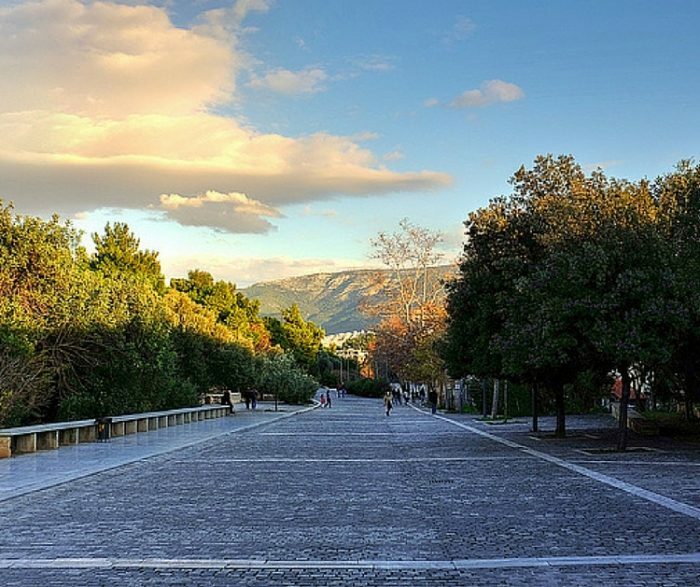 Dionysiou Areopagitou to Apostolou Pavlou, plus a path to the Acropolis is about 1.5 miles one way. There are multiple paths from the base that lead to the Acropolis. 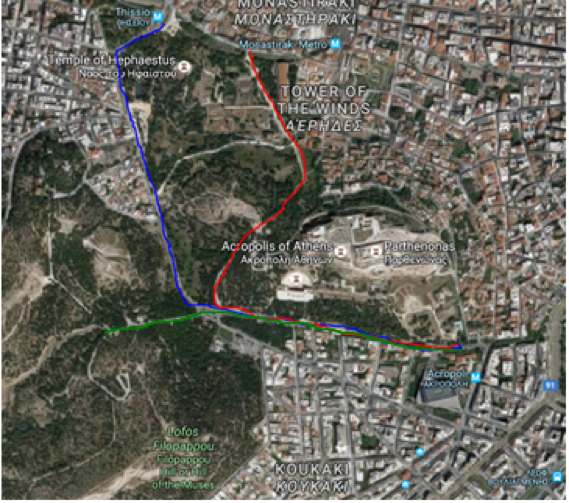 To extend the run, head downhill and connect to the paths that leads up to Philopappou Hill (green line) and try multiple paths on the hill. There are 2-3 miles of gently rolling footpaths here. Sites include Πνύκα, Soctates Prison, and Theatro Doras Stratou. Another add-on option: The National Gardens, which is 1.5 km west of the Parthenon. naturally like your website but you have to check the spelling on quite a few of your posts. Many of them are rife with spelling problems and I find it very bothersome to tell the truth nevertheless I’ll definitely come back again. Thanks for your marvelous posting! I certainly enjoyed reading it, you could be a great author.I will ensure that I bookmark your blog and definitely will come back in the foreseeable future. I want to encourage you to definitely continue your great job, have a nice morning! I wanted to jot down a simple remark in order to say thanks to you for the superb guides you are posting here. My time intensive internet research has at the end of the day been recognized with reasonable insight to write about with my family. I ‘d point out that most of us website visitors are unequivocally fortunate to be in a notable community with very many awesome people with interesting things. I feel quite blessed to have come across your entire web pages and look forward to many more thrilling minutes reading here. Thank you once again for everything. If you wish for to increase your knowledge simply keep visiting this web site and be updated with the most up-to-date gossip posted here. & theme. Did you build this amazing site yourself? Please reply back as I’m planning to create my very own site and would love to learn where you got this from or just what the theme is called.